Important: This demo uses direct access URL to Poloniex API, which may be prevented by CORS restrictions in browser. If the demo does not work, try accessing the following URL directly first, then reload this page, so the source is cached. This demo shows how you can implement a simple “Order Book” chart using our Serial chart. 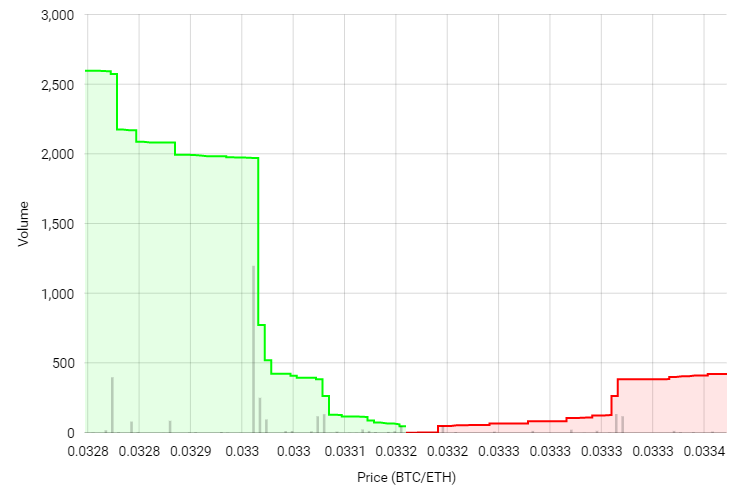 The chart shows a real distribution of booked sell and buy orders for bitcoin and their volume. This chart uses amCharts 4 build-in external data loading functionality. In this case we load data directly from Bitcoin exchange Poloniex API. Since the API returns data in JSON format that is not directly compatible with amCharts Serial chart, we pre-process the data using parsedData adapter. The chart is set to reload the data every 30 seconds. Adapters in amCharts 4 is a very powerful concept. It allows defining custom functions to dynamically modify just about any value or property on the chart, including dynamically loaded data.